I Skate, Therefore I Am: Will new CPSC laws have affect skateboarding industry? Will new CPSC laws have affect skateboarding industry? 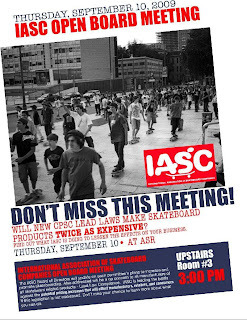 The International Association of Skateboarding Companies will be holding an open board meeting at ASR on Thursday, September 10, 2009 at 3 PM . Among other things the board will be discussing the new Consumer Protection Safety Commissions new lead laws and what effect they will have on the skateboarding business. The Consumer Product Safety Improvement Act focuses on lead and phthalate content in toys and consumer goods. The IASC Board of Directors will update on each committiee's plans to increase and promote skateboarding. Also addressed will be a concern to all manufacturers of all skateboard related products-Lead Law Compliance. IASC is leading the battle against the potential pricing increase that will affect manufacturers, retailers, and consumers if this legistaltion is not addressed. Learn more about what you can do by checking out DACS Skateboarding under News & Events. We will keep you updated on your involvement.